Gift cards can be bought in the increments listed. 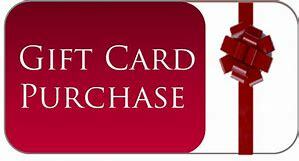 If you are looking to purchase $40.00 then add 4- $10.00 gift cards to cart. Please note if you want multiple gift cards in the comment section. Gift cards will be mailed out ASAP. They can not be printed.